Story: In Ice Age: Dawn of the Dinosaurs, much-loved characters from the worldwide blockbusters Ice Age and Ice Age: The Meltdown are back, on an incredible adventure... for the ages. 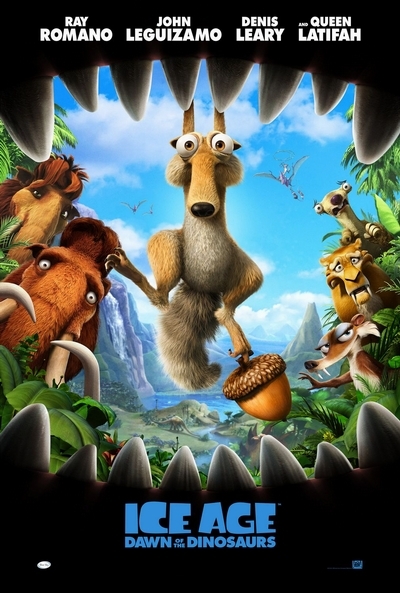 Scrat is still trying to nab the ever-elusive nut (while, maybe, finding true love); Manny (Ray Romano) and Ellie (Queen Latifah) await the birth of their mini-mammoth, Sid (John Leguizamo) the sloth gets into trouble when he creates his own makeshift family by hijacking some dinosaur eggs; and Diego (Denis Leary) the saber-toothed tiger wonders if he's growing too "soft" hanging with his pals. On a mission to rescue the hapless Sid, the gang ventures into a mysterious underground world, where they have some close encounters with dinosaurs, battle flora and fauna run amuck - and meet a relentless, one-eyed, dino-hunting weasel named Buck.